Concerns about parking, truck deliveries and flooding due to a proposed expansion of the Danish Home of Chicago retirement community at 5656 N. Newcastle Ave. were expressed at the Jan. 16 meeting of the 41st Ward Zoning Advisory Committee. Alderman Anthony Napolitano told residents that there would be many more meetings if needed so that the final plan addresses the concerns of the community. "Please don’t leave here thinking this is a done deal. This is a process," he said. "It’s nowhere near a done deal." 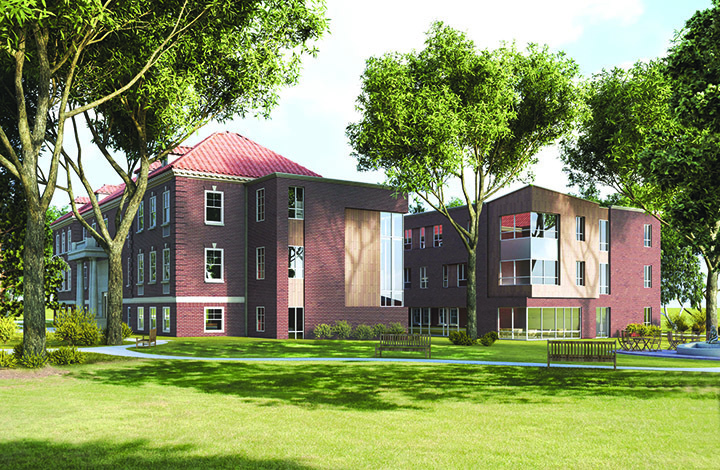 About 40 people usually live at the Danish Home, which has a mix of independent living and skilled nursing beds, but under the expansion there would be 10 additional independent living units. The Danish Home was founded in 1891 and has been located at its current location since 1907, when a white farmhouse stood on the site, according to the home’s president and chief executive officer Scott Swanson. In 1914, a new building was constructed there, and over the years there have been several additions to the three-story structure. Several audience members said that while they are glad to have the Danish Home in Norwood Park, they are worried that the proposed expansion would worsen flooding and parking problems already associated with the property. Some residents said that delivery trucks for the Danish Home sometimes block their alley. Project attorney Sara Barnes said that the residents’ concerns would be addressed as part of the planned development review process, which will involves several city agencies. She said that the project would include a storm water retention plan for the property and that the possibility of on-site parking and deliveries can be explored. Some area homeowners also expressed concern that most of the addition would be constructed along the alley that separates their property from the Danish Home, blocking their view of its garden. "I’d rather look at that than a three-story brick wall," a man said. Some homeowners called for the project to be scaled back, while one resident said that the project should be a "non-starter" with the city given that the neighborhood is governed by a special overlay zoning district. The district sets additional zoning requirements intended to make sure new construction is compatible with the area’s existing pattern, which features large residential lots and low-density development. Barnes said after the meeting that the project would be allowed under the rules of the district. She added that details of the expansion would be included in the site’s planned development ordinance so that new construction would be limited to the final plans, including a maximum of 59 beds, she said. The expansion may be constructed in two phases, with the initial phase estimated to cost $8.1 million, Swanson said. The project would include a new dining room that would overlook the garden and a dry creek where rainwater could collect, he said. The Danish Home prides itself on encouraging its residents to get out in the community by using the home’s shuttle service, and family members are always welcome to eat with the residents, Swanson said. Swanson added that he has asked the food distributors which deliver twice a week to the home to park on the street instead of the alley. The Danish Home is considered an orange-rated building on the Chicago Historic Resources Survey for its potentially significant architectural or historical significance, and the city’s landmarks division would be reviewing the project’s plans, Barnes said.